How are we disciplined to think about environmental problems and possible solutions? 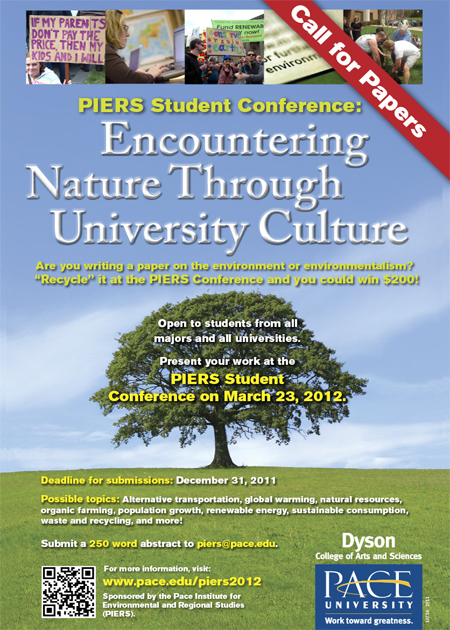 We are inviting undergraduate and graduate students to submit their original research on the environment and papers written for an environmental studies class in Fall 2011 to present their work at the PIERS student conference in Spring 2012. The theme is “Encountering Nature Through University Culture.” In our studies, we encounter nature in many different ways: small-scale, large-scale, in parts, or as a whole. As you do your research and write your papers on nature and the environment, we would like you to pause and reflect on how we are disciplined to think about environmental problems and possible solutions in various fields of study, including the natural sciences, the social sciences, the humanities, and in the fields of business, engineering, medicine, law, public policy, and more. Depending on our area of specialization, we may seek nature in the lab or in the field or in texts; we may perceive nature with one or more senses or with the help of machines; we may describe nature or analyze it; we may express nature in numbers or in words or in images; we may try to manipulate nature or simply contemplate it. Consequently, we may come to think about ourselves, as well as our relation to environment and society in different ways; and often these differences clash. So we want to evaluate competing claims regarding actions towards the environment. Ultimately, we want to know if we can extend moral considerations to nature, and if so, in what ways. This leads to other questions: How do we communicate across traditional disciplinary boundaries? Is there a common language we can learn to speak? Is there a common culture we can begin to develop? How can we move from a multidisciplinary tradition to an interdisciplinary tradition without one voice dominating the other in our present university system? And finally, how can we disseminate our findings, beyond a small community of experts in the fields of science, technology, and policy to reach a broader public? The conference will provide a forum for students to present their work, also visually, exchange ideas, and network with others across disciplinary and institutional borders. Our goal is to develop new ways to communicate our diverse research agendas and results to a broader public and interest them in sustainability. To submit your work, email the registration form including a 250-word abstract to piers@pace.edu. There is a registration fee of $10 to help us cover the costs for display boards and supplies, which we will provide for your convenience. Please send a check made out to PIERS to 41 Park Row, 7th floor, New York, NY 10038. The deadline for proposals is December 31, 2011. To attend, please email piers@pace.edu. Registration is free but we need to give a list of names to security. Please bring an ID to enter the building. Notifications will be sent via email in late January. Accepted work will be grouped into poster sessions around common environmental issues and fields of study. One hour will be allotted for each poster session. We anticipate scheduling three poster sessions. Each presenter will be allotted 10 minutes. PIERS will provide display boards (36” x 48”) and push pins. Directions to the NYC Campus. Please enter on Spruce St. to register and retrieve your name badge. Thanks to Dean Nira Herrmann, Dyson College, and Pace University for their support!